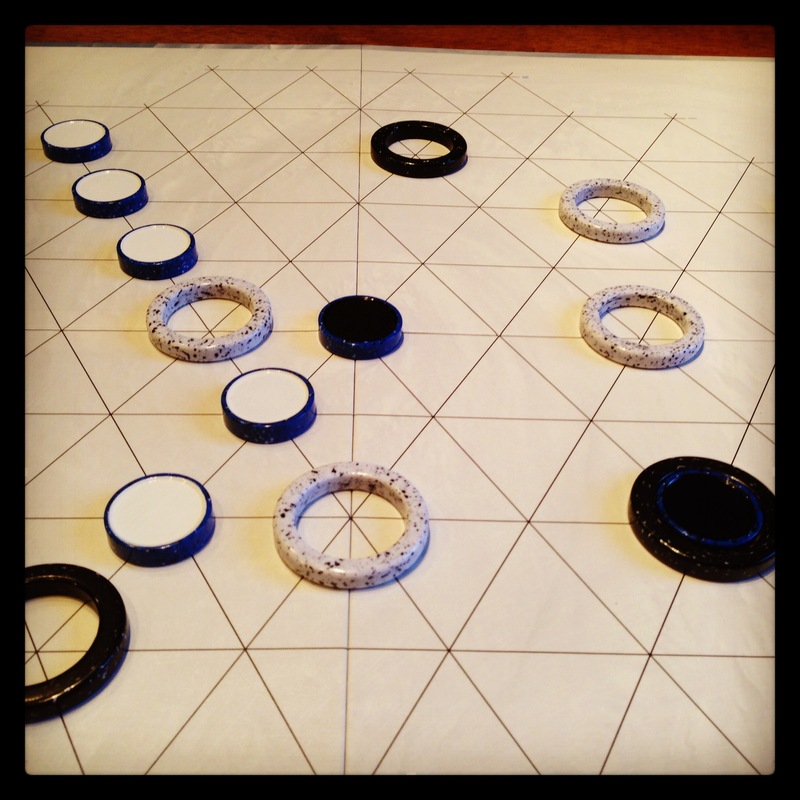 The board consists of a hexagonal grid, with lines intersecting with one another. On your turn you do one thing: Place a round Marker into one of your Rings with your color (black or white) facing up, and then move the Ring along any line you’re connected to for as long as you’d like, or until you hit another Ring, or until you pass over any Markers—at which point you place the Ring on the next intersection after the last Marker you pass over. Every marker you passed over is now flipped to its opposite side—black to white and white to black. This is not optional. 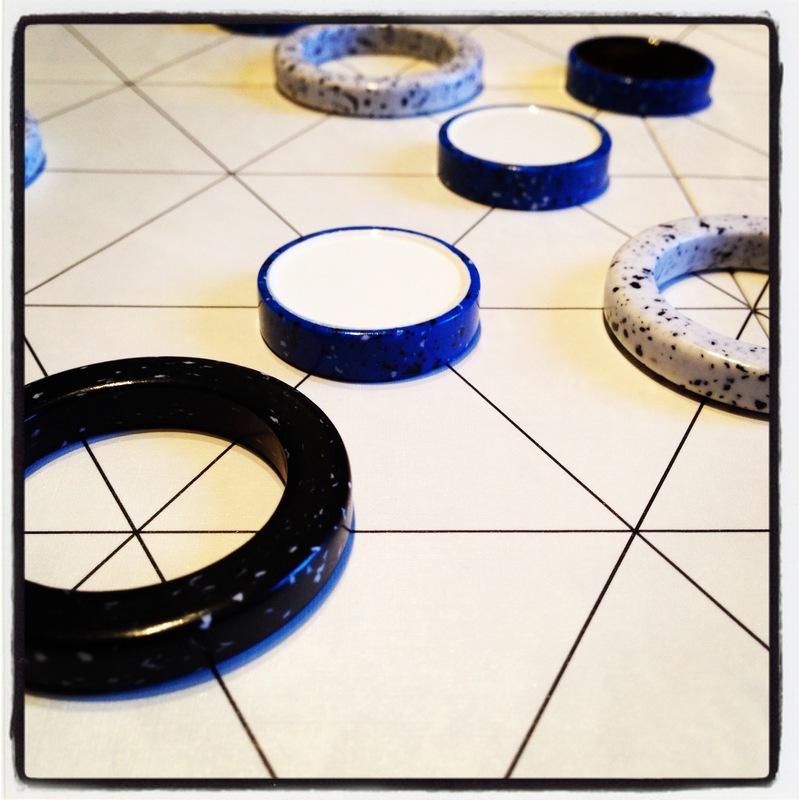 Once there are five Markers of a color in a row on the board, that player removes a Ring from the board and places it on the space provided along that player’s edge. Once you’ve managed to remove three Rings, you win. I’m not a huge fan of abstracts, but for some reason these games in Project Gipf just grab me. They have simple rules, but deep gameplay. They have beautiful bits. They each feel different. And finally, I’m terrible at them. 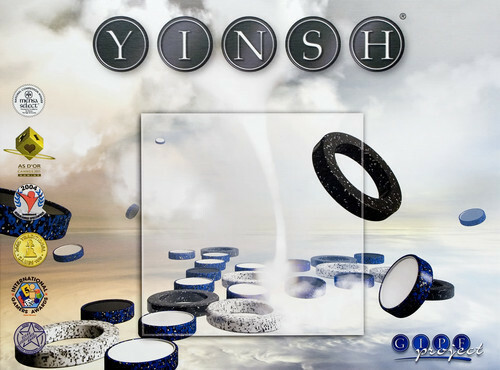 Yinsh is the game I pull out when someone wants to play an abstract from my collection—well, Yinsh or Ingenious…but we’re talking about Yinsh today! My 9-year-old played this when he was 8, and had no problem picking it up and doing well. One of my favorite things about this is how the game balances itself with a sort of catch-up mechanism. When you remove a Ring, you’re one step closer to winning, but you’re also now more restricted in your options on the board, because you have fewer pieces to work with. Now, of course, this doesn’t always mean the person behind will now catch up, but it makes it slightly easier to do so, and I like that. There are also subtle ways to mess with your opponent. You can “trap” his Rings by placing your Rings where he wants to go, or make it so his only move with a Ring will benefit you by flipping Markers to your side. One of the barriers to abstracts is that they often seem daunting to new players, Someone new to Yinsh might not dominate right away, but something about the gameplay, aesthetics, and simple rules makes this a great entry point for someone new to abstracts. And as someone who’s not new to them, I still really enjoy this too. It’s a great addition to Project Gipf, and any collection. I wrote last week about your podcast regarding the sound quality. I said it sounded sped up however it turns out I’m an idiot. 🙂 There is a button on the podcast app that allows it to be sped up and I inadvertently touched it. My apologies. Keep up the good work. My wife likes this one, but I like Zertz. Both are excellent games that play rather quickly. I played this game a long time ago at a local coffee shops game night. (both of which no longer exist.) I played the game with my wife and shortly after we both forgot the name of the game. All we could remember was rings and disks. Finally years later we figured out the name and then a week or so later I see this post. I never new it was part of a bunch of games, I’ll have to check out the others sometime.